If everything goes according to plan, world automotive lovers will see the VW's first electric car will roll out on the streets at the end of this year. Next year, it is the turn of the electric SUV will stole the public's attention, followed by the modern and electric VW Kombi and electric autonomous sedans in 2022. Those four concept cars above were built using the MEB (Modularer Electrobaukasten) platform as a result of VW's own design. This platform is very flexible if you see the different types of cars that are quite drastic on the four concepts above, but VW apparently still not satisfied. 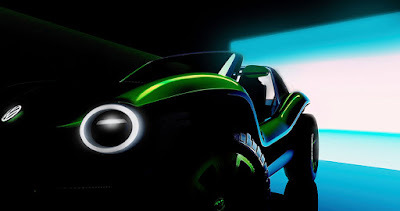 Recently, the German auto giant revealed a teaser image of a car concept named VW I.D. Buggy. As you can see in the picture, this concept car is a dune buggy that is much inspired by the trend of the modified VW Beetle in the 1980s. A variety of distinctive buggy elements are clearly implied from the appearance that is ready to devour the off-road or sandy terrain, even to the side that is not equipped with any doors. This type of car is definitely not for everyone's consumption, unlike the previous four VW concepts. However, it still used the same MEB platform; VW basically wants to prove that this platform can also help the development of vehicles that fall into the niche category, and which will only be produced in limited numbers. So far there are no complete details regarding these VW I.D. Buggy. This concept is planned to be presented to the public for the first time at the 2019 Geneva Motor Show held in March.